Ski to Avoriaz up to -70% off To take advantage of these offers, join now for free! Avoriaz has everything to make your skiing holiday unforgettable. Unspoiled mountains with breathtaking views, unusual but incredible accommodation, and great fun for the entire family. But best of all, there's guaranteed snow from December to April. It has the unique advantage of being France’s only totally pedestrianised resort. Here you can walk, sled and ski all over, without worrying about cars. In fact, cars are nowhere to be seen - even the taxis are horse-drawn sleighs! Avoriaz is a wonderful resort for families. With a unique Children’s Village, it has lots to offer and activities to keep everyone amused for hours. Children up to 16 years old receive a reduced rate ski pass, with a free ski pass for children under 5. There are also two snow parks exclusively for children. For those who love skiing and wonderful scenery, Avoriaz is the place to be. If you’re an advanced skier, there are 20 red and black pistes to try as well as plenty of opportunities to challenge yourself. One of our favourite spots is off the Chamossiere Express. Let’s not forget the incredible array of festivals, concerts, music events and the fairy-tale Christmas festival of lights, which is not to be missed. Wrapped in a blanket of snow, Avoriaz offers every one of its visitors ‘ski-in, ski-out’ convenience, regardless of where in the resort they are staying. Choose Avoriaz and you will experience a truly unforgettable skiing holiday full of fun and wonder. Waterfalls, rocks, and tropical jungle make up the Aquariaz aquatic complex, located more than 1800 metres above sea level. It has special areas catering for different age groups, providing activities and chill out areas for adults too. With a water temperature of 29 degrees, it is the perfect place to unwind after a day on the slopes, and you can even relax in the outdoor Jacuzzi, where you can also take in the incredible views. The wonderfully evocative horse-drawn rides are available five times a day, and there really is no better way to explore the resort in style, with the added bonus of guided tours. If being close to nature in a winter landscape is your thing, this is a must do! Ever wanted to take a ride on a dog sled? This is your chance! Children, in particular, adore these thrilling rides, which will provide your family with unforgettable memories. You will be amazed at the speed at which you will be whizzing through the beautiful scenery. A relatively new concept, the "Stash" is a snowboarding paradise in a forest setting, where adults and children can not only ride together but also explore the protected environment. This amazing venue offers the opportunity to dine, entertain, dance or simply enjoy a drink, surrounded by ice. Ice sculptures, an ice bar, and various other frosted surprises await you for fun-filled winter nights. The Village Igloo is made completely from ice for an experience like no other. It can accommodate up to 12 people per night, with duo rooms for 2 people or Camp de Base rooms for 4 people. You will sleep on ice beds covered in animal skin, which keep out the cold. These igloos have beautiful custom-made duvets which are able to withstand polar conditions, so you will be cosy and snug all night long. The Village Igloo terrace provides a wonderful space to enjoy your breakfast and in the evening, you can try the typical dish of the region, a Savoyard cheese fondue. You can choose from a standard one or two bedroom apartment on a self-catering basis, all with fully equipped kitchens. 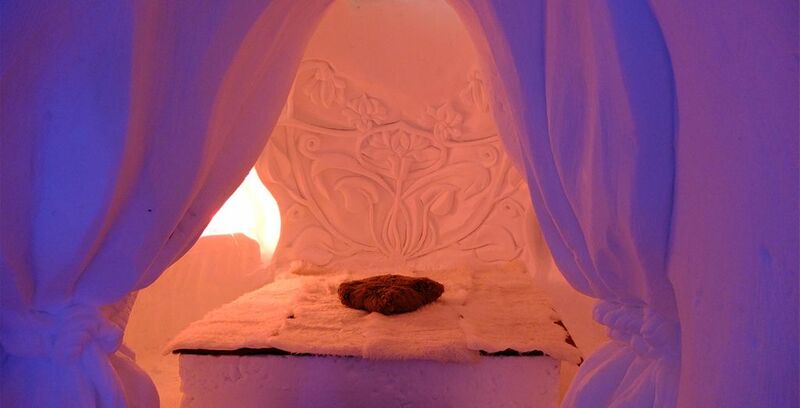 After a wonderful day on the slopes, bask in the warmth of the sauna and hammam to relax your muscles. Sportier types can take advantage of the cardio fitness studio. 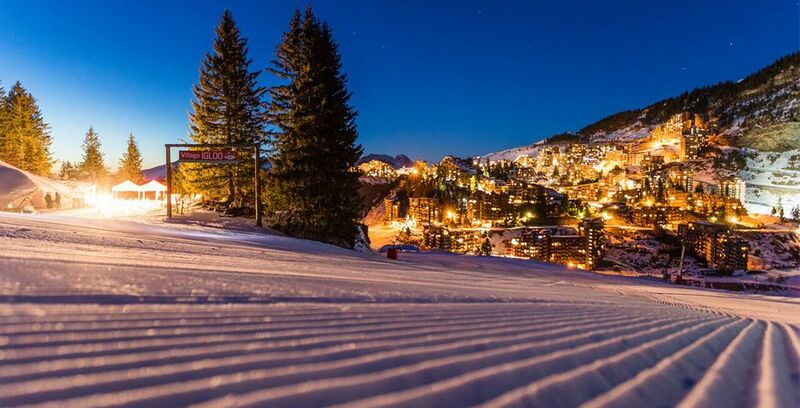 Avoriaz is one of the easiest resorts in the French Alps to reach from the UK. Flights between London and Geneva take approximately 90 minutes. There are several ways to get to Avoriaz from the airport, either by train or bus from Geneva, Thonon or Cluses. There is also the option of a transfer, shared minibus or private taxi. • Bring plenty of socks and underwear. Ideally, you want a pair of each for each day plus a couple of spares. • A good ski base layer – a long-sleeved top plus long-john style pants are essential. • A bottle of travel wash - in case access to laundry facilities is limited, a bottle of travel wash will come in handy for cleaning socks and underwear. When is the best time to ski in Avoriaz? The best time to go skiing in Avoriaz depends on what kind of skiing experience you’re looking for. If you’re looking for guaranteed snow, January and February are best. By this time, the resort will usually have a good snow covering, which normally lasts until April. What budget to plan for ski holidays to Avoriaz? Staying in a self-catering apartment and cooking your own meals will save you money and generally a budget of £500 for a week should be sufficient to cover ski passes, rides, and general extras.